Trioplast develops, manufactures and sells packaging materials, hygiene and custom-made chemical films. The company was founded in 1965 in the Swedish province of Småland. The original business idea was to produce packaging with what was then the ‘new’ material: polyethylene. Trioplast Industrier AB, the parent company, is organized into business units Stretch Film, Industry Film, Printed Packaging, Hygiene Film and Small Business Units. Product examples include: packaging stretch film, agri-products, shrink wrap, wood film, garbage bags, industrial packaging, printed and embossed hygiene films, industrial films and bags. Recycled polyethylene is an important raw material for several of these products. 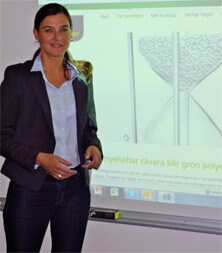 Trioplast had sales of approximately SEK 4.2 billion (2010) and has 1,300 employees. Plastics are malleable. At room temperature, they are solid. But warm them up, they become flexible and can be molded into products with different looks and characteristics. If the temperature is high enough, plastics melt. Plastics consist of small molecules formed during the cracking of crude oil. About four percent of the world’s crude oil is used to make plastics. Small molecules (monomers) are built together into long chains (polymers). By branching different polymer chains together and with the addition of different chemicals, one can produce resins with a variety of properties. Plastics have many uses. 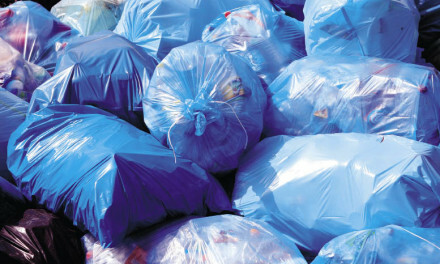 In Europe, nearly 40 percent of plastic is used by the packaging industry. A challenge for the plastics industry is to produce plastics from a different commodity than crude oil or gas. There are different choices and it is possible for example to build up polymers from lactic acid. The lactic acid may for example be produced by biotechnology from cornstarch. Another approach, described in this article, is to use sugarcane-produced ethanol to then extract the monomer ethylene, which is the building block of polyethylene. Without chemistry, the world would look very different and our planet would certainly not exist in the way we know it. Chemistry is in our air, in our soil, in our water and in all living organisms. Chemistry shows us how the world works. It helps us develop new drugs, increase food production, find new energy sources and discover materials with tailored properties. Chemistry helps to solve many of humanity’s challenges, but at the same time leads to environmental problems. Many of these problems occur because fossil-based hydrocarbons are used as a raw material. Crude oil and other non-renewable fossil materials emit the climate changing gas carbon dioxide when they are processed. The pursuit of renewable raw materials is in full swing in chemistry laboratories around the world. Let’s examine one interesting initiative from the packaging industry, where ‘green polyethylene’ helps to reduce the climate impact of plastic products. “A trend reversal is in sight when the classic polyethylene can now be produced from renewable resources,” says Susanne Thygesson. “A trend reversal is in sight when the classic polyethylene can now be produced from renewable resources,” says Susanne Thygesson, project manager at Triogreen™, about the new product Trioplast. “The intention is for our green polyethylene products to have exactly the same technical characteristics as traditional packaging materials. There is nothing in the green polyethylene’s chemical composition that has changed. It is the same ethylene molecule to form polyethylene, but as the raw material is renewable, the carbon footprint is much smaller. The researchers at Chalmers helped us discover this,” continues Thygesson. The chemical process is based on polymerized ethylene, CH2 = CH2, for polyethylene, (-CH2-CH2-) n. Ethylene is thus the common denominator between the green and fossil-based polyethylene. From a chemical standpoint, the resulting polyethylene product is identical to conventional polyethylene and new properties such as biodegradability do not arise. The material can of course be recycled in the same way as fossil polyethylene. What is new is that ethylene is produced from ethanol, in a sugarcane juice distillation process. A new factory in Brazil, under construction, will manufacture ethylene and polyethylene from ethanol in this way. It will be the world’s largest facility of its kind, but the production capacity of 200,000 tons per year, is, in a global context, still very small. Trioplast could be an interesting alternative for this Brazilian factory. Tetra Pak is another Swedish packaging company that uses green polyethylene. One needs different additives in a polyethylene film such as pigments, abrasives, antistatic agents and printing inks. 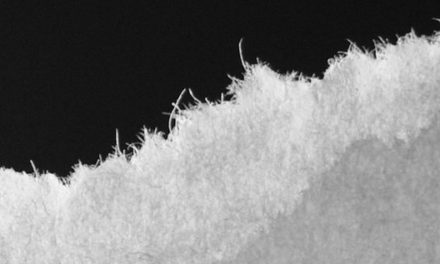 It is therefore not currently possible to produce a polyethylene film consisting only of renewable raw materials. “Our ambition is to offer the highest content of green polyethylene in the product as is technically possible. A major advantage is that we can use existing production equipment and production methods as we convert green polyethylene into finished products,” says Thygesson. For the Brazilian producer of green polyethylene the goal is that all ethanol must come from mechanically harvested sugarcane crops. This method has many advantages from an operational, safety, hazard and environmental perspective compared to manual harvesting. It is also important for Trioplast to ensure compliance throughout the supply chain – from Brazil to Sweden – with laws, regulations and codes of conduct for all the companies involved. Chemistry is a borderless science offering opportunities to create products that deliver prosperity and simplify the lives of many people. The development of green polyethylene gives consumers opportunities to make environmentally friendly choices everyday. There are indications that green polyethylene will lead the way to other plastics based on renewable raw materials and manufactured using biotechnology. One example is the Brazilian plant currently under construction.